This is an unusual McCoy item! 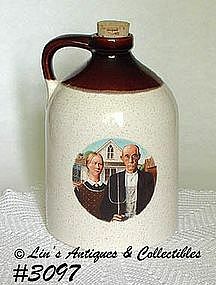 Made in 1973, this is the “American Gothic” jug. 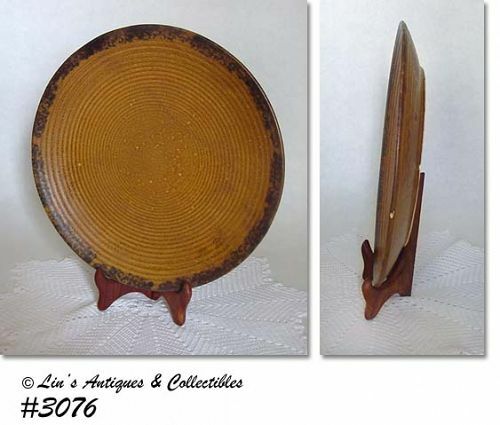 Measures 9 ¼” tall and is in excellent condition! Excellent condition unmarked McCoy cornucopia vase! 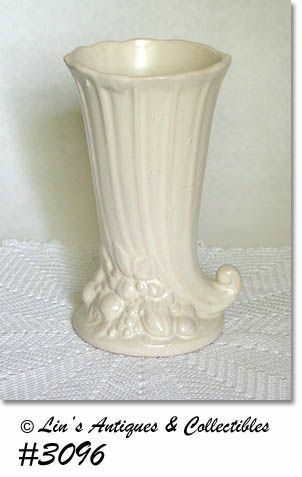 Made in 1932, vase measures 8” tall and is white with matte glaze. It has in-mold leaves and berries at base. It’s difficult to believe the age of this vase because it has always been pampered – no chips, no cracks – wow! 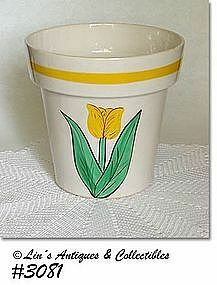 This is a super addition to a matte white or older McCoy stoneware collection. 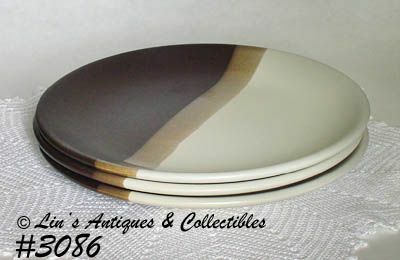 Excellent condition McCoy Sandstone dinner plates! There are 3 in listing and they are the very difficult to find smooth shape (they do not have the ridge/lip edge). Marked USA and have no “use” evidence – have some typical McCoy glaze flaws that are production and are of no consequence. 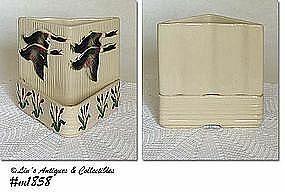 Very pretty Enesco Prayer Lady napkin holder! This is the pink dress lady with darker brown hair. Stamped on bottom: E-2826 and still has original Enesco foil sticker. She’s in excellent condition – I could feel a teeny blemish on the hem of her skirt, and even using a magnifying glass, cannot be certain if it’s a ding or a production bruise but either/or, it’s not worthy of mention. Lovely item! 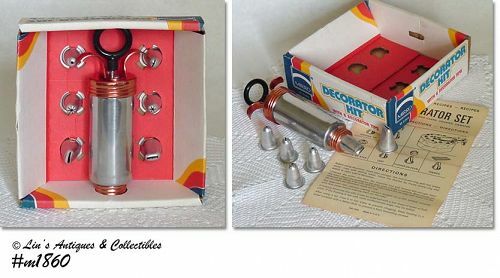 This is a neat aluminum listing – a decorator kit by Mirro Aluminum! Still in the original box, it looks new, and has the recipe/directions sheet. There are 6 decorator tips “for cakes, cookies, and canapés” and tips make stars rosettes, leaves, flowers, ribbons, and one is a writing tip. Great item! These lovely Shawnee bookend planters are difficult to find – this listing is for a single! It’s in excellent condition – no chips, no cracks – has a very faint stain line from actually being used as intended. Marked on bottom: Shawnee, USA, 4000. Very nice! Another mint condition listing! This one is a wallet with matching key case made by Amity. They’re both green – such a popular color in the 1970’s – and are in their original box! 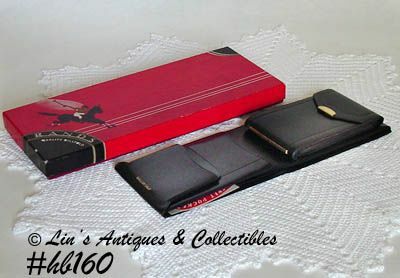 This listing has a mint in box vintage billfold made by Rands! Wallet is black and has impressed in gold color lettering “Gallun Calf”. Box has “Rands Quality Billfold”. 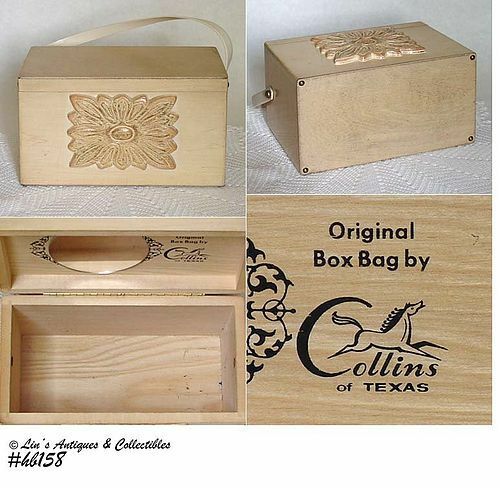 This is an unusual Collins handbag – it’s a wooden box bag without “jewels”! 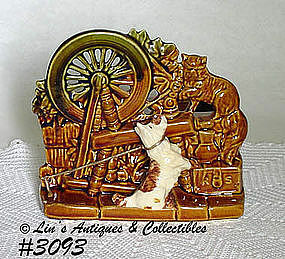 The only ornamentation on this one is a pretty carved wooden piece that is attached to the front of the purse. Handbag has minor evidence of “use” – some scuffs and inside bottom has a few ink marks. Overall condition is very good on this difficult to find Collins handbag! Beautiful McCoy vase from the Arcature line of 1951! 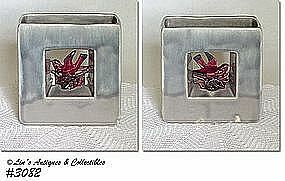 Vase is gray with burgundy color bird. Measures 6 1/8” long, 2 ¾” wide, 6 5/8” tall and is in excellent condition with minor crazing. Has been used as a planter and has a faint stain line. It also has some typical McCoy glaze skips/color runs. Marked on bottom: McCoy, USA and it has 2 incised letter “I”. 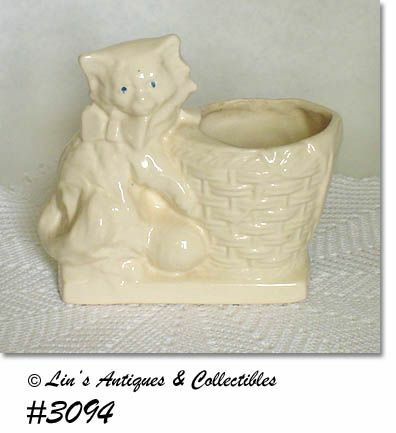 This is a beautiful McCoy cookie jar “part” – it’s the flowerpot jar! Missing its lid but the bottom is in excellent condition. It would be a beautiful centerpiece filled with a silk floral arrangement or with a potted plant set inside. Marked on bottom: McCoy, USA. Lovely item! Another nice Canyon item – a round platter! Measures 12” diameter, marked USA, and has no “use” evidence. The rim has a ¼” white spot that at first glance appears to be a chip – it’s not – it’s a glaze pool that popped off! I looked at it with a magnifying glass and there’s color in the white part indicating a production McFlaw. This is a very nice dinnerware item and it is priced to reflect it being a little less than perfect. 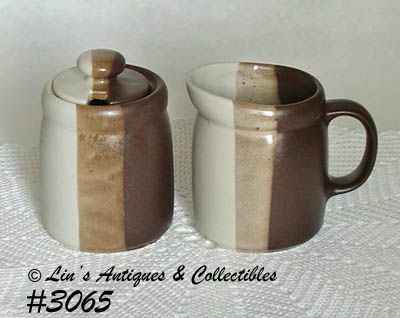 This listing has a really cute little McCoy pitcher and bowl set! 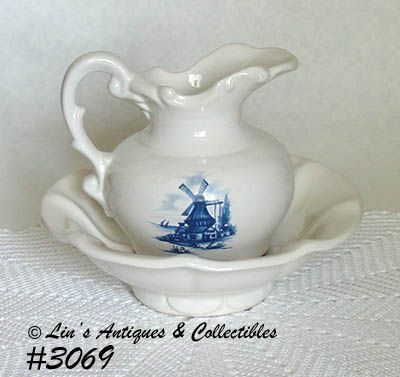 Very decoratively styled, set is white and pitcher has blue windmill decal. Pitcher measures 5 ¼” tall (at tallest), bowl is 2 5/8” tall, 7 ¾” wide. Pitcher and bowl are in mint condition – bowl has a slightly darker area in bottom and a dark dot on edge, both are under glaze and are production not “use”. Very pretty and not your everyday find! 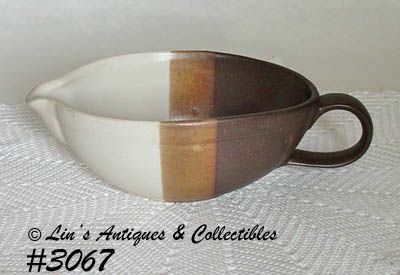 Another pretty Sandstone item – a gravy boat! Marked on bottom: McCoy, Lancaster Colony (mark), USA. Excellent condition! Mint condition McCoy creamer and sugar from the tri-color Sandstone line! Measure 3 ¾” tall and are marked: 1414, USA. Beautiful colors – look new and unused!